I love this Company it is one of my all time favorite. 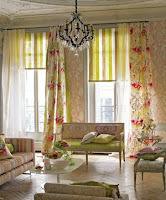 I was able to peruse the new Designer Guild Spring Fabric and Wallpaper collection this week. 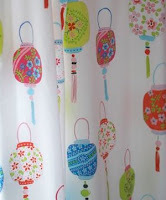 The colors are bright, fun but elegant at the same time (typical designer guild style). Tricia Guild the master mind behind the designs is a brilliant designer. 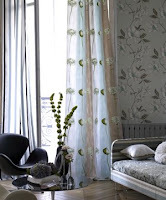 I have admired her fabrics and wallcoverings since I started working in Interior Design at Zander's Interiors in Madison Wisconsin. At Zander's they had this fabulous designer who always used these farbics and really funs and bright colors schemes. 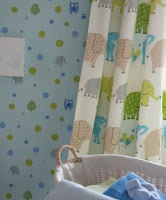 I can see using these fabrics as great pillows or window treatments. I think that if you had neutral funiture and were looking for a way to liven the space up or give it a spring or summer look this would wake up the room and give it the boost that you were looking for. The wallpaper would be great to use in the middle part of decorative paneling. They show this a lot on there website. It would punch up the room and you would not need a ton of yardage. 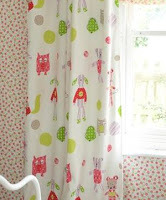 Designer Guild a collection called Primrose Hill that would make great kids rooms fabric and wallcovering. If you are looking for a way to do a nursury or kids room in a fun and not so cutsey, way this farbic and wallcovering would be perfect! These are a few of my favorites I love the elephants. This fabric below I thought would make a great sunroom cushion or window treatment it has great motif. I was able to get my gardens finished just in the nick of time for planting. This year I am concentrating on 2-gardens. I created new vegetable garden and replanting a existing perennial garden with a rock wall next to our deck. I was able finished both this past weekend which was next to amazing with a 7 month old. I was able to till and prep the soil in the vegetable garden and plant carrots, beets, onions, and sweet peas. I may be a little late with the carrots. The old perennial garden was a bit of a job due to the hostile day lily take over. They multiplied everywhere, I know I will be pulling new sprouts out all summer. I decided to checked out the Beaver Lake nature center plant sale and I was able buy some really nice plants and receive a lot of help and information from their experts. Being the new gardener I am, I started seeds in little grow pots this year. My husband thought I was crazy and told me I should buy my vegetable/herb plant more mature. But no.....I had to start seedlings from scratch. I planted the seedlings about a month ago they were doing so well I was so proud of their progress. I decided to put them outside to acclimate them and to give them some fresh air, my unfortunate mistake was I set them in the sun instead of the shade. I fried my little seedling. The Lupines were a few of the survivors pictures below. I guess I will be buying plants this year. I think that gardening is going to be a learning experience for me. On Mother's day weekend we had an outing to a private garden http://.sycamorehillgardens.com/ near us. I had been dieing to see this house and grounds every time I pass it I had no idea that they opened it up to the public a few times a year. The grounds were an amazing 25 aces of beautiful and different gardens with all sorts of interesting species of plants, swan ponds, stone towers and statues. They had a variety of evergreen trees large and dwarfed that looked like they belonged in a Dr. Seuss book.